DD5LP/P – December 31th. 2015 – DL/AM-178 Ammerleite. My attempt to activate Ammerleite earlier in the year had been stopped by the road being blocked by a farmer moving his crops and I was told that the road that I had used three times before was private and I could not access it. This is despite Google and other mapping systems reporting it as a public road. 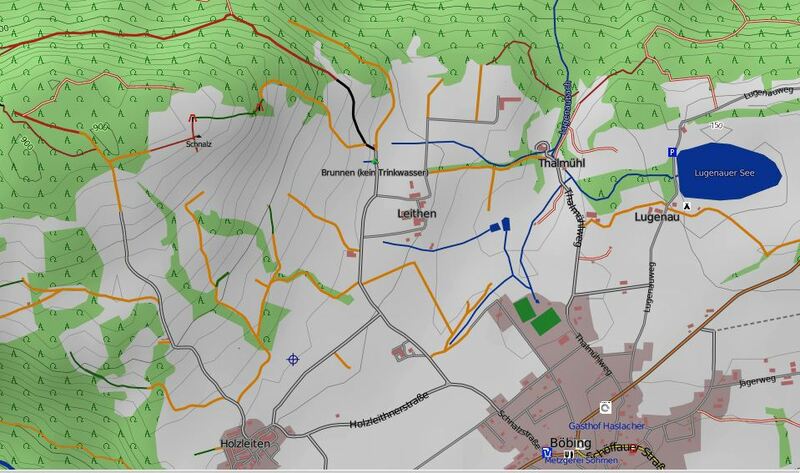 As always in SOTA, we have to avoid causing issues especially around access routes, so I have been researching an alternate access route from the other side of Schnalz (which is the correct name for the Summit – Ammerleite is the complete area). There is even a road called Schnalzstrasse that comes out of the village of Böbing, that the summit overlooks. Even with the new route, I did not consider it too difficult and indeed my wife agreed to come along as well. As noted above, there is a road named SchnalzStrasse on the western end of the village of Böbing. Take this road until you leave the village and come to a junction – now take Leitner Strasse (the direction being up the hill). If I remember correctly, the walking trails are also signposted from this point onwards – you need to follow B7 which on some signs is called Schnalz Gipfel or Schnalzrundgang or similar. Driving further up Leitner Strasse you come to a Y junction where the left fork has the sign saying that access past this point is restricted to farming and forestry workers only. This is just past where there is a small fountain on the left that has a horses head in wood as its spout (water not for human consumption). There is also a hut on this junction (see photos in slideshow below), I drove down the right hand fork and parked on the grass (later others had done the same, so this seems to be the acceptable point to park and start walking). Now it is simply a matter of taking the left hand fork, following the route B7 up the ever steeper hill and around the corner until you go through a stile into an open field. The opposite side of the field has a turnstile and after you go through that you can just see the cross through the trees up and to your left. This is where you need to head to, to take advantage of the two benches and fence posts to locate your radio gear. Once I had put the antenna up, and laid out the rig and log, I found a faulty contact on the coax from the antenna but was able to position it so that it was connecting (after investigation at home, it was the inner core of the coax that had broken away from the centre pin of the BNC plug). I also noticed that although the SWR was now fine, the power out indication seemed low. 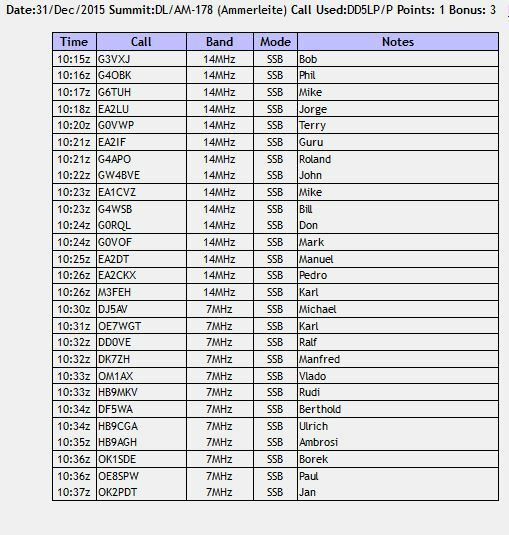 I then realised that I had the FT817 switched to 2.5w rather than 5w output for all of the last activation on Herzogstand! I tuned around the bottom 1MHz of 10m and apart for the DL0IGI beacon on 28.2050 on Peissenberg being off the scale on the FT817 (I could see the antennas from my summit) there was nothing on except for some interference, presumably from equipment not meant to be on 28MHz at all (I suspect the weather station – which was also very close – but I can’t prove this) – there was NOTHING on the band that I could hear. So I tried spotting myself and putting out CQs for about 10 minutes but to no avail. The band was totally dead! Never mind, now I know the “authorised” access route I can try again in the new year, bag the activator points again and hopefully some 10m contact points as well for the challenge. I then decided to try 20m, where the results were far better with 15 contacts in 12 minutes. I followed this with a stint on 40m and bagged another 12 contacts in 12 minutes. On both 20m and 40m I was still just running the 5w from the FT-817 into the OCF dipole. I didn’t unpack and set up the amp as I could see a storm coming in. Indeed just as I stopped operating, the first few rain drops fell. A quick pack away and head down the hill and when we reached the car the rain storm really started. The activation was completed with a stop for soup in a nice cafe in Rottenbuch on the way home. Unlucky with the 10m band conditions (they improved later in the day), but lucky to get down and away before the storm came through. Although somewhat further and a lot steeper, this access route appears to be, by all of the signposts, the way that the locals want you to approach Ammerleite – or we should now say Schnalz. This entry was posted in SOTA and tagged Ammerleite, DL/AM-178, SOTA by VK2JI DD5LP G8GLM. Bookmark the permalink.